For past St. Patrick’s Days we’ve made Magic Leprechaun Pudding Pie and our version of Shamrock Shakes. 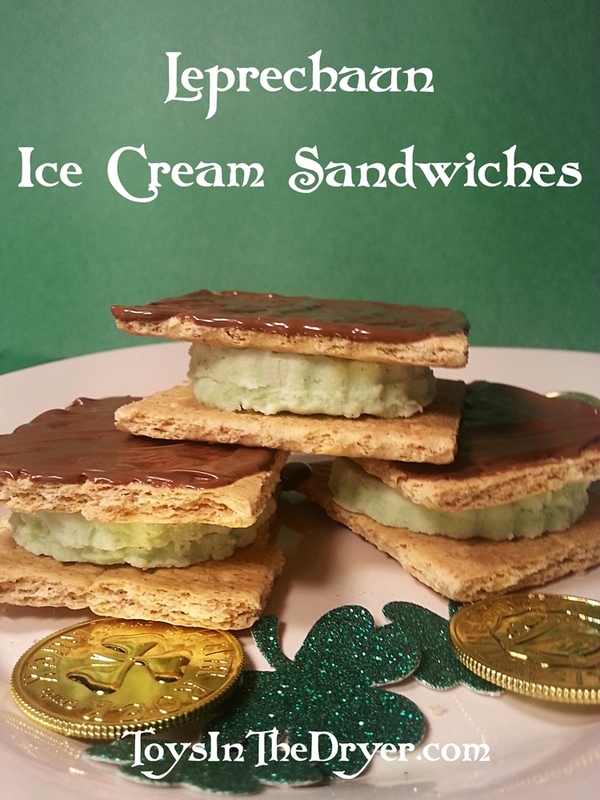 Today we’re making Leprechaun Ice Cream Sandwiches! These tasty treats are sure to make a great addition to any St. Patrick’s Day celebration! 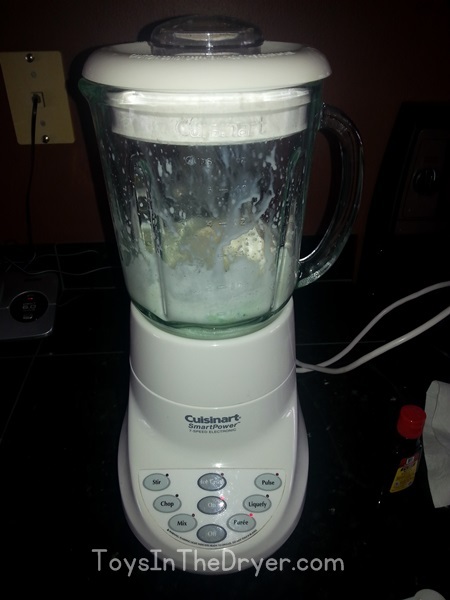 1) Blend the ice cream, mint extract, green food coloring and milk in the blender. I admit, I don’t measure when I do these things. It’s really just per personal taste. Only use enough milk, however, to get the ice cream to blend. You do NOT want the mixture to be soupy, it needs to be just thin enough to pour or slightly thicker than milkshake consistency. 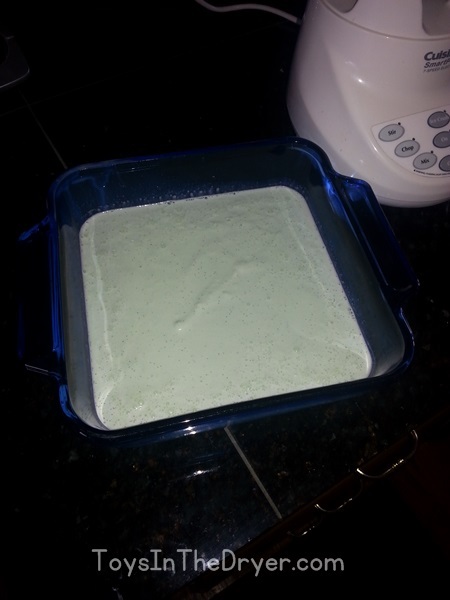 2) Once blended, pour the mixture in a freezable flat pan. I used a 9×9 baking dish. You want your mixture to be at least 1/4-1/2 inch thick in the pan. 3) Freeze flat until hard again. My mixture only took a few hours. 4) Once hardened, cut your sandwich filling out with a cookie cutter. Hint: the first one was a bit hard to get out, after that it was easier. 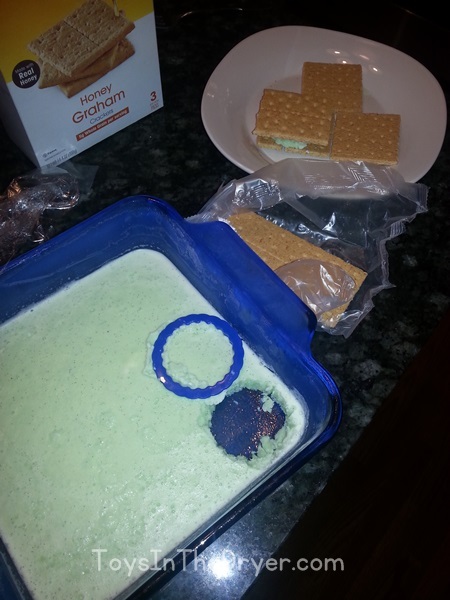 Place the ice cream between two graham crackers. 5) Melt chocolate and drizzle or spread on the top of the sandwich. I was going to drizzle the chocolate on the top of my sandwiches but I ended up messing up so I just spread it. The girls liked the extra chocolate anyway! 6) Freeze again for later or eat right away. If you let the sandwiches sit in the freezer overnight the graham crackers will soak up a little of the ice cream moisture and will soften just a bit. There you have it, Leprechaun Ice Cream Sandwiches, a unique treat for your St. Patrick’s Day celebrations.